Land at Christchurch (CHC) airport and want to explore Christchurch and its surroundings by rental car? Then make a good decision when you rent your car at one of the six or so car hire companies at Christchurch Airport. Compare the offer of all car rental deals from a small number of compact cars to a sporty SUV in New Zealand and rent the car that's best for your journey of discovery in New Zealand. Where's the Car Hire pick-up at Christchurch Airport? Most car rental companies are located at Christchurch Airport, either directly in the international arrival hall or, if you have already booked your rental car online, offer you a shuttle service to the city office. The departure stations of the shuttle service are located outside the terminal when you leave it via exit one or two. Even if there is no petrol station at Christchurch Airport, you don't have to search for a petrol station long if you want to drive into the city center, as there are petrol stations on almost all major roads. The nearest Caltex petrol station, which is open 24 hours a day, is located at the intersection of federal highway 1 and federal highway 73 if you follow the signs to Rolleston. Christchurch Airport, which was recently rebuilt in 2009 with a budget of $200 million, definitely leaves nothing to be desired, so you won't have to go hungry from fast food restaurants, cafés and sushi restaurants. But there is also plenty of duty-free shops, fancy boutiques and entertainment options for the whole family. Of course, you also have the option of using the free Internet network throughout the airport. Would you like to set off on an adventure with your rental car? 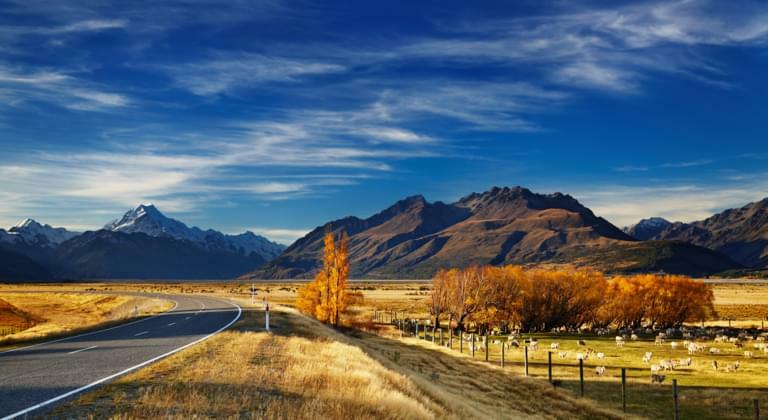 Then why not rent a car and go on a round trip around New Zealand's South Island to explore the most beautiful sights and the most fascinating stretches of land on your own. Especially recommendable is a drive along the west coast to Timaru, where a visit to the Otipua Wetland is worthwhile and to Oamaru with the pretty Grainstore Gallery, from where you can continue your journey to Dunedin with its beautiful Chinese garden. Of course, you can also continue to the south of the island from here, but a trip across the island to Gore with its Hokonui Moonshine Museum and via Lumsden to Te Anau with its Bird Sanctuary and the "Fiord vintage machinery museum" is a must. But before heading back to Christchurch from here, you should definitely take a detour via Queenstown with its Underwater Observatory. Our tip: Just rent an economical small car to explore both the South and North Islands and return your rental car to a car rental station on the North Island e.g. Auckland and benefit from low one-way rentals.